Italian cuisine has had a bad reputation in the world of health for as long as we can remember. It is true that Italian food is typically full of cheesy goodness, carb-filled heaven, and rich deserts. 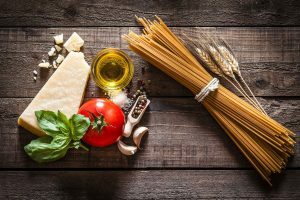 However, there are actually countless health benefits of Italian food that many people don’t know about. If you weren’t already, here are some healthy reasons to indulge yourself in the best cuisine in the world. Olive oil might be the most obvious health benefit. Olive oil is widely known as a very healthy fat, filled with ones called monounsaturated fats that are extremely beneficial for your heart health. It also helps reduce low-density lipoproteins, which are the “bad” cholesterol that negatively affects your heart. Instead, it boosts levels of high-density lipoproteins, which are the good kind of cholesterol that removes harmful cholesterol. It can be found in salad dressings, pasta dishes, used to cook seafood, meat, or veggies, or simply in a dish for bread to be dipped in. 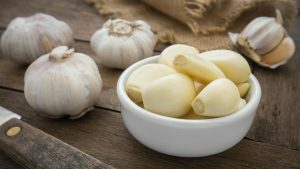 Garlic is strong in more ways than just spicing up your food and making your breath smell bad. It has amazing antibacterial and anti-fungi properties. Even better, it contains sulfides that fight risks of almost every type of cancer; breast, colon, throat, stomach, skin, etc. Its commonly found in the majority of Italian dishes, from sautéed vegetables to pasta sauces. Also known as the staple fruit of Italian food, tomatoes are rich with potassium, and both vitamin C and A. If thats not enough, tomatoes also contain lycopene, a heart protective antioxidant. Cooking tomatoes is an easy and effective method to bring out the available lycopene. 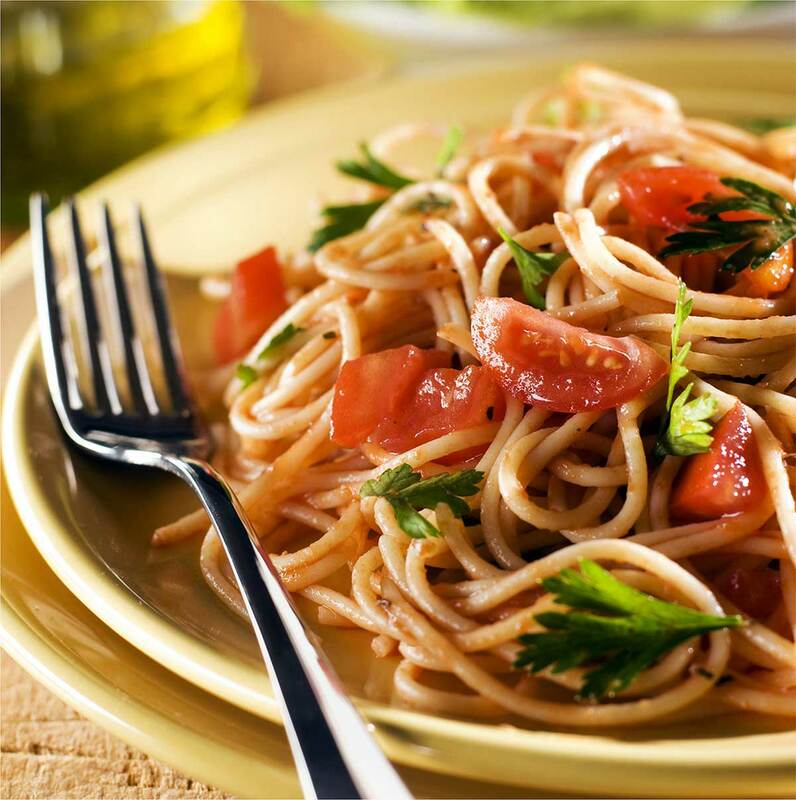 Eating pastas dishes with fresh, homemade tomato sauce is a great way to boost your lycopene intake, ensuring a healthy heart. Thats right, carbs aren’t all bad for you! As opposed to refined grains, whole grains have a lower glycemic index which means they don’t raise glucose and insulin levels with a dramatic spike. Instead, they retain fiber, magnesium, and vitamin E. Sustaining a diet rich with whole grains can protect against heart disease and diabetes. Whole grain pastas are served in a variety of ways at Italian restaurants so you will never be limited to one dish. Whether it be grilled fish, shrimp, or octopus, the health benefits of seafood are plentiful. Specifically, salmon is often attributed with low cholesterol and high protein. It is true that salmon is rich in omega-3 fatty acids, selenium, B vitamins, and antioxidants. However, shrimp doesn’t get nearly enough credit for the omega-3 fatty acids it contains. A healthy dose of shrimp provides a sufficient amount of omega-3 acids to decrease inflammation, lower blood pressure, and improve the function of cells lining your arteries. Stop in for our salmon dish complete with lemon, capers, and a white wine sauce or our Cioppino Mediterraneo, which is a seafood lover’s heaven; fresh fish, clams, shrimp, calamari, and mussels in a light tomato fish broth. If those don’t appeal to your taste buds, Spumoni is proudly home to all of the healthy ingredients above! We are proud to offer something that everyone will love, especially when they include these health benefits. Next time you’re craving Italian, head into Spumoni Restaurants and don’t feel guilty indulging a little bit!